It has been a busy and exciting start to the Year. Design and planning is progressing on several of this years newly awarded projects based in London with another in Portsmouth. We are 95% complete on our latest striking Cor-ten and Anodised aluminium project for the new Thames Valley Science park in Reading. 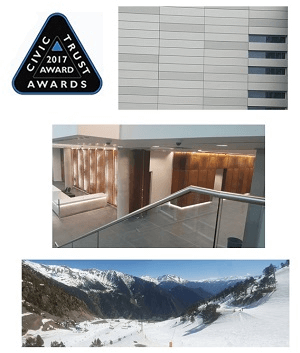 Our Sutton project with feature staircases and eye catching internal and external Cor-ten panels has been successfully completed and Shaftesbury Theatre has picked up another award, this time at the 58th annual civic trust awards. 16 of our team travelled to the Pyrenees for a team building weekend which was encouraging and now becoming an annual event. Some exciting news also in that our new Water jet and larger High definition plasma CNC machines have arrived and are currently being installed as we continue to invest in the latest technology.